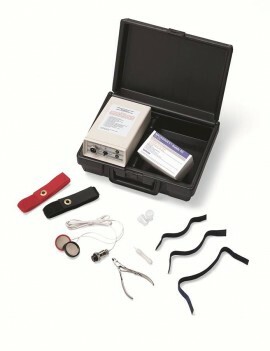 The 1959 pad absorption method of Gibson and Cooke, which introduced pilocarpine iontophoresis for sweat stimulation, is generally regarded as the reference method for sweat testing. Although generally free of intrinsic error, the method is long, tedious, requires a great deal of technical skill to administer and therefore invites human error. The Macroduct System has forever eliminated the errors inherent in all previously used methods and offers an easily standardized test. The Webster sweat inducer and Macroduct sweat collector produce a pure specimen of eccrine secretion for analysis by using either chloride analysis with a Chloridometer or total electrolyte analysis with the Sweat-Chek Analyzer. These instruments provide simple and accurate analysis of the specimen. Together with the Macroduct Sweat Collection System, they have become the world standard, used by thousands of labs worldwide. Macroduct is approved for sweat stimulation and collection by the U.S. Cystic Fibrosis Foundation, and is rapidly replacing the pad absorption method where laboratories want standardized tests. With the Macroduct system, sweat testing is both accurate and simple. Sweat Testing consists of three separate procedures, the first one being sweat stimulation. The improved Webster Sweat Inducer accomplishes pilocarpine iontophoresis simply by activating a start switch. It gently delivers a safe and optimal quantity of pilocarpine for gland stimulation (equivalent to five minutes iontophoresis at 1.5 mA). The Model 3700 has integral fail-safe circuitry to limit the applied voltage and warn of open circuits. Current is brought up slowly to full power and then reduced slowly at completion of iontophoresis to minimize patient discomfort. Two standard 9-volt batteries supply power. Pilogel® Iontophoretic Discs are unique gel reservoirs of pilocarpinium ions that are simple and safe for iontophoretic sweat stimulation. There are no electrolyte solutions to prepare or to keep track of, and no messy electrolyte pads that must be saturated with separate solutions. Instead, a Pilogel disc is inserted into each of the recessed stainless steel electrodes, which are then attached to the patient. The Macroduct Sweat Collector is a unique disposable plastic device having a shallow, concave under-surface. The Macroduct is placed over the iontophoretically-stimulated area on the skin and firmly strapped in place. Sweat secreted by the sweat glands is forced from the ducts under hydraulic pressure and flows between the skin and the concave undersurface of the Macroduct collector and into the micro bore tubing spiral. A small amount of blue dye allows easy monitoring of the accumulated sweat volume. After a sufficient volume of sweat has accumulated, a sweat dispenser, or blunt needle on a tuberculin syringe is connected to the open end of the tubing. The tubing is then uncoiled from the body of the Macroduct and severed at the point of attachment. The sample can then be expressed into a supplied sealable PCR tube or directly into the analytical instrument. Either a micro-sample chloridometer or the Wescor Sweat-Chek Analyzer performs the analysis phase of Wescor's sweat testing protocol. Interfacing perfectly with Macroduct, Sweat-Chek measures the total electrolyte of the sweat specimen and displays the reading in equivalent NaCl molarity units (mmol/L). While clinicians have traditionally used sweat chloride or sweat sodium ion assay, sweat conductivity is also a proven method of sweat analysis. It is a simple and reliable indicator to confirm or exclude the physician's clinical diagnosis of cystic fibrosis. After cleaning the selected area of skin on the patient, the electrodes with Pilogel discs installed are attached to the patient's arm with the provided straps. Pressing RUN on the Webster Sweat Inducer activates Iontophoresis. If everything is normal the current flow reaches its peak at about 20 seconds as pilocarpine iontophoresis begins. Sweat stimulation occurs under the positive electrode while the disc under the negative electrode completes the electrical circuit. Reliable, uniform, gel-to-skin contact ensures delivery of pilocarpine over the whole skin area, thus providing total gland stimulation and maximal sweat yield. After iontophoresis, the electrodes are removed, and a Macroduct Sweat collector is firmly attached to the stimulated skin site. The base of the sweat gland is 2 to 3 mm beneath the surface of the skin. Fluid secreted by the gland creates hydraulic pressure that moves the fluid upward through the sweat duct to emerge from the skin as sweat. When sweat surfaces beneath a Macroduct collector, the secreted sweat is directed to the orifice and into the plastic "macroduct" tubing. After attachment, sweat becomes visible in the spiral tube of Macroduct within one to four minutes, depending on the relative elasticity of the skin and the subjects sweating rate. The emergent sweat is turned blue by contact with a small amount of blue water soluble dye applied to the Macroduct collection surface This allows easy assessment of the sweat volume at any time during collection. When collection is completed, the spiral tubing is severed from the Macroduct base and the sweat specimen is introduced into the Sweat-Chek analyzer or expressed into a storage cup for chloride analysis at a later time. A typical Macroduct sweat collection produces many times the sweat volume needed for analysis. In cases where sweat yield is below average, measurement is possible using 6 to 10 microliters of sweat, with careful technique. The Sweat-Chek Sweat Conductivity Analyzer with its temperature controlled measurement cell, flow through operation and wide range digital readout, is a modern adaptation of a proven analytical method. Dr. Lewis Gibson, one of the worlds leading authorities on sweat testing, commented on Sweat Chek: "If this machine is kept clean, it gives results that are every bit as reliable as an analysis for sodium or chloride.